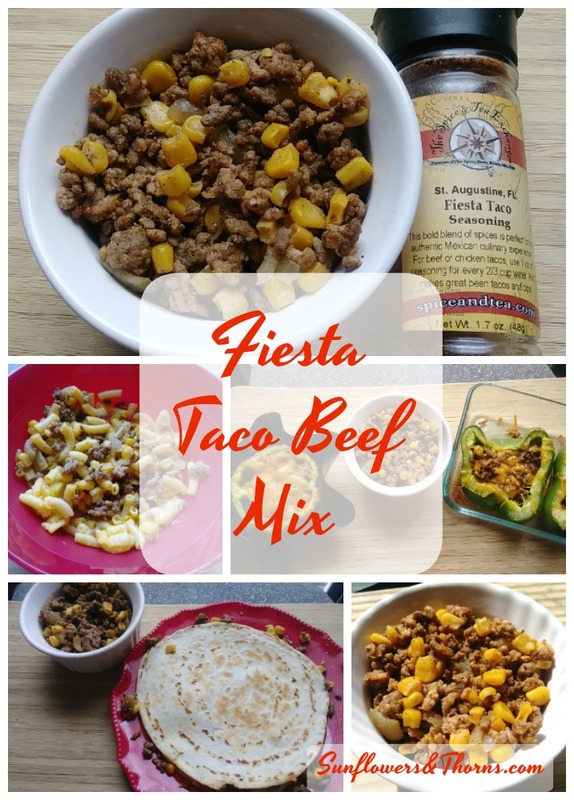 Taco Beef mix made with the Fiesta Taco Seasoning from Spice & Tea Exchange is amazing and can be used for a variety of dishes. When we were in San Antonio, we “discovered” the Spice & Tea Exchange. I put that in quotations because we both knew of the store and even lived a few blocks from one early in our marriage. But this was our first time to actually visit a store. We are always on the lookout for new rubs, spices and flavorings, especially if they are reduced sodium versions. We often make our own blends to reduce the salt. John found the Fiesta Taco Seasoning and we decided to try it. When we got it home, we searched online to know how much to use. The only directions were a tablespoon for every 2/3 cup of water. That made no sense to us at all because it didn’t translate to how much seasoning for the amount of meat. We searched online and found one vague reference and adjusted the recommendation to fit our taste. We hit the jackpot! We use 1 tablespoon for every 1 pound of ground beef. For frame of reference, we tend to use one of those taco flavor packs for every two pounds of beef, which is double the amount of meat recommended on the packet instructions. We tried using two tablespoons of the Fiesta Taco Seasoning for one pound of beef and it was so strong it burned our tongues. 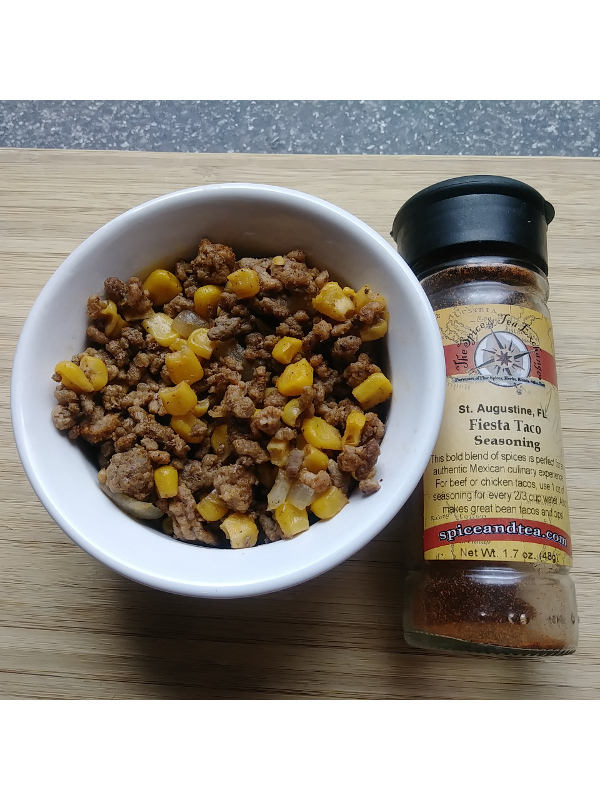 We’ve tried this seasoning on its own to make taco meat and recently decided to “beef up” (yes, I went there) the recipe to create a mix that can be consumed on its own but also as a filler for tacos, quesadillas, casserole, and stuffed peppers. I’m sure there’s more, but that’s all we’ve tried so far! 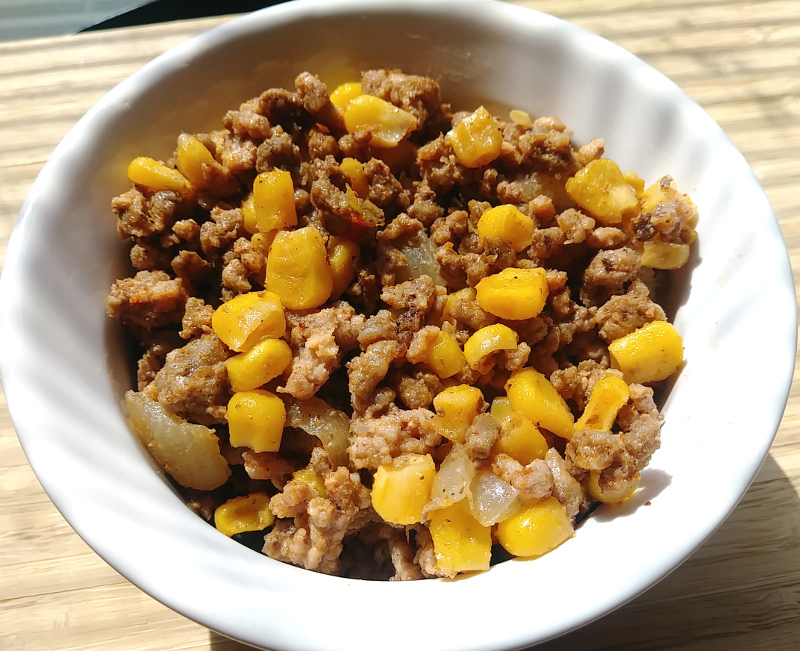 This fiesta taco beef mix is delicious! 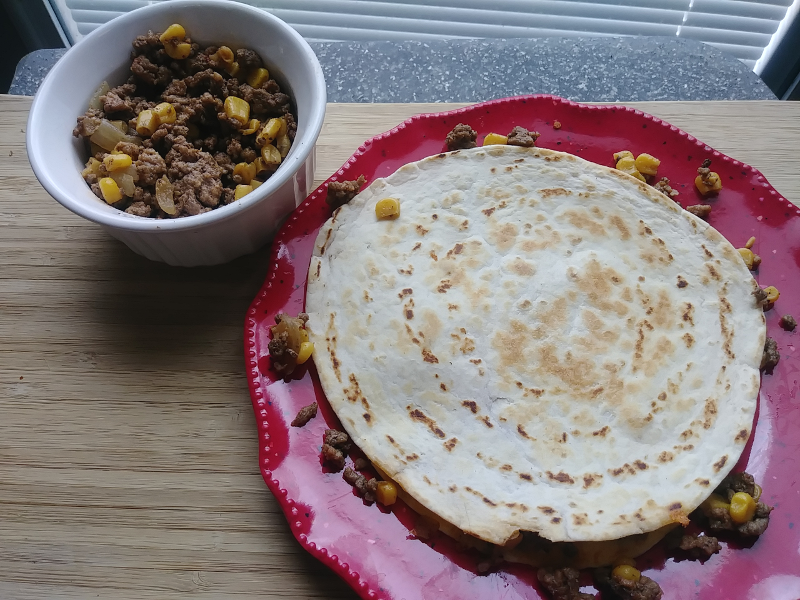 You can eat it on its own or as filler for quesadillas, tacos, stuffed peppers, and more. Serve with whichever dish you want. *If you prefer, you can wait until the beef is browned and drain the grease before adding the seasoning with however much water you usually use for this method. This recipe made about five cups of mix. 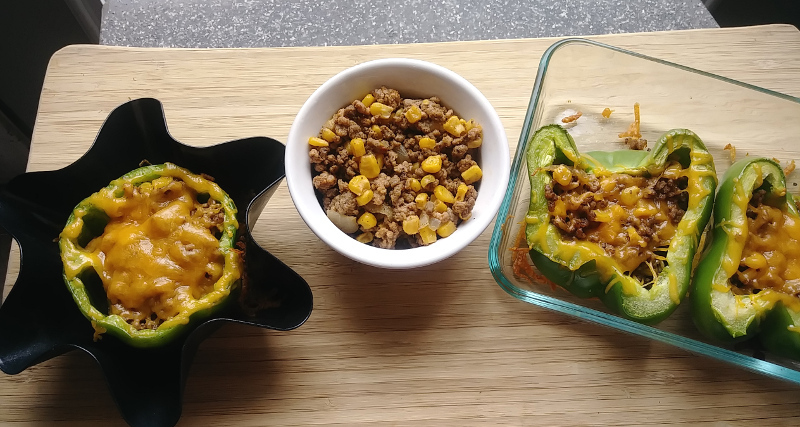 I use sharp cheddar cheese and the fiesta beef mix to make a less carby version of stuffed peppers. I know the corn adds carbs but at least there is no rice. It tastes better than it looks! 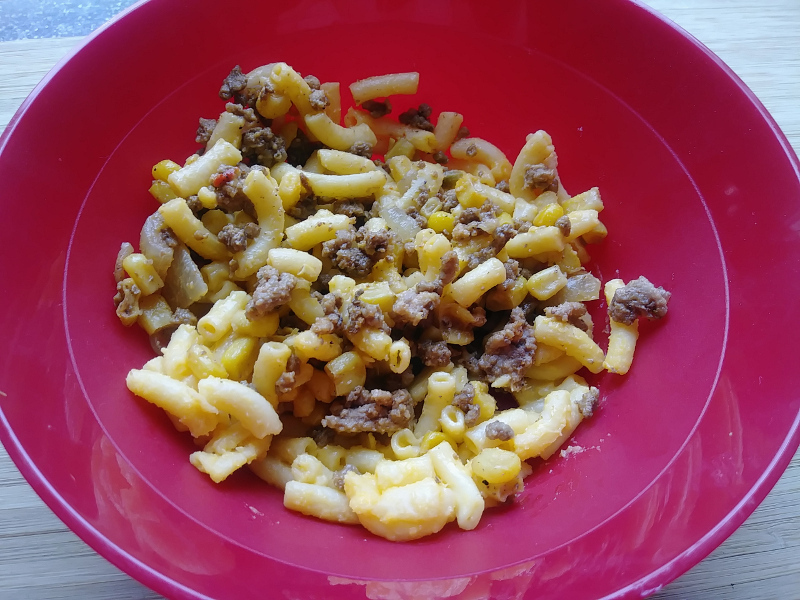 I love to mix the fiesta beef with just regular boxed macaroni & cheese. Quesadilla anyone? I use sharp cheddar cheese to help balance the flavors. I also like Colby/Jack cheese, but it tends to tone down the fiesta taco mix too much.